Outgoing PayPal chief David Marcus, seen here in what would make for a nice Facebook pic. 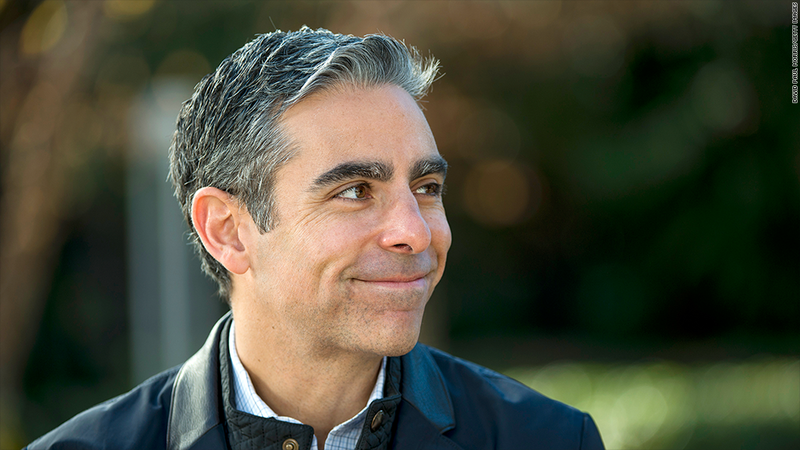 PayPal chief David Marcus is jumping ship for Facebook. PayPal parent eBay (EBAY) said Monday that Marcus, who was named president of the unit in April 2012, "has made a career decision to focus on what he loves most -- leading smaller teams to create great product experiences." In his new role, Facebook said Marcus will "lead our efforts in mobile messaging." "Messaging is a core part of Facebook's service and key to achieving our mission of making the world more open and connected," the company said. "We're excited by the potential to continue developing great new messaging experiences." EBay shares slipped 2.6% in after-hours trading Monday following the announcement. Facebook (FB) shares ticked up 0.5%. The move comes at a time when many analysts believe Facebook is poised to expand into the mobile payments business. The company is hoping to obtain regulatory approval for a mobile payments system in the United Kingdom, The Financial Times reported in April. Facebook has also been active on the messaging front. It purchased mobile messaging app WhatsApp for a stunning $19 billion in February, and in April, it broke out its own messaging service into a standalone app. Marcus' move to Facebook also comes on the same day that Amazon (AMZN) launched a new service allowing customers to automatically pay recurring charges, such as monthly subscription fees or phone bills, using their Amazon log-in details. The new Amazon Payments feature will go head-to-head with PayPal.